Play AVCHD and YouTube Video on Apple iPad 2. Apple iPad 2 supports DivX, MPEG-4, WMV and Xvid, H.263, H.264. To enjoy any videos on this larger-screen device, Any Video Converter will do all the conversions for you. It is an easy-to-use Apple iPad 2 Converter to convert any video formats to Apple iPad 2 video format with fast speed and high quality output, and it supports other popular video conversion from rm, m2v, vob, 3gp, mov, mpg, flv, avi, mp4 to Apple iPad 2. In addition, this Apple iPad 2 Video Converter is also a video editor and DVD creator that allows you edit any videos and burn videos to DVD. With Any Video Converter, it’s easy to convert any video files to WMV or MP4 format to be played on Apple iPad 2. Please follow below steps to get playable videos for your amazing Apple iPad 2 tablet. How to convert videos to MP4 format for Apple iPad 2? Step1: Add the video clips from your hard drive to the program. You can also download videos from YouTube, Google Video, Metacafe or Nico Video to the Windows Mobile Video Converter. Batch video conversion and merging videos are supported. 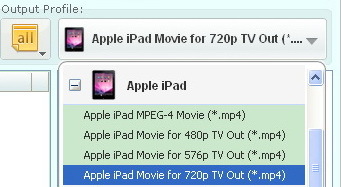 Step 2: Choose output profile "Apple iPad Movie for 720p TV Out(*.mp4)" in the profile. Tips: Since Apple iPad 2 supports full HD (1080p) video with 30fps, and MP3, AAC, OGG, WMA, AMR-NB/WB, FLAC, WAV, AC3, MIDI, RTTTL/RTX, OTA, i-Melody, SP-MIDI music, so you can customize video and audio settings (e.g. Video Codec, Video Bitrate, Audio Codec, Audio Bitrate, Audio Channel) in Any Video Converter to enhance the experience of enjoying videos on Apple iPad 2. If you prefer WMV video instead of MP4 video format, you can select "Customized WMV Movie (*.wmv)" as output profile. 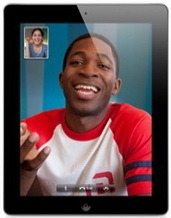 With the above settings, Apple iPad 2 can play your MP4 and WMV videos perfectly. Step 3: Click Convert button to start converting videos for Apple iPad 2. Once the conversion is finished, you can click "Output Folder" button to get the output MP4 and WMV files. Then connect your Apple iPad 2 with computer, import output videos into it, and have fun! Wanna convert DVD movies? Any DVD Converter Pro rip DVD for Apple iPad 2. Any DVD Converter is the excellent DVD to Apple iPad 2 converter software which can help us convert both of your NTSC and PAL DVD to WMV and MP4 for playing on Apple iPad 2. Besides WMV and MP4 formats, the DVD converter can rip DVD to AVI, MPEG, MKV, ASF, M2TS, XviD, FLV, MP3, etc. with high quality and fast speed. With Any DVD Converter, you can rip copy protected DVDs to Apple iPad 2. For instance, you can rip the Twilight Saga Eclipse to Apple iPad 2, convert The Last Airbender to Apple iPad 2, rip Toy Story 3 to Apple iPad 2, convert A Christmas Carol to Apple iPad 2, rip Inception to Apple iPad 2. Want to enjoy your iTunes video on Apple iPad 2? 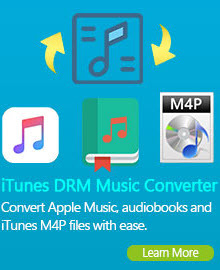 The easiest way is to use AVCLabs M4V Converter, the best iTunes DRM cracker, which is capable of removing DRM protection from your purchased iTunes M4V movies. Any Video Converter is an excellent MKV video converter software, which could convert MKV to AVI, MKV to MP4, MKV to MP3, MKV to FLV, MKV to WMV, MKV to ASF and many other popular formats with fast conversion speed and best quality! This MKV file converter can also support many portable player and mobile devices, including convert MKV to Apple iPad 2, MKV to iPod video, MKV to iPhone 3G, MKV to Zune, MKV to 3GP, MKV to PSP, so you could enjoy your MKV movie everywhere. To play QuickTime MOV video on Apple iPad 2, you will need to convert the MOV to MP4 or WMV format supported by Apple iPad 2. 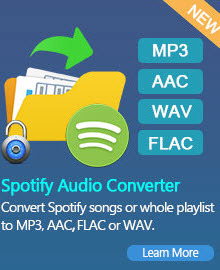 Any Video Converter is a QuickTime MOV Converter which helps you convert QuickTime MOV to MP4 and WMV easily. Besides its excellent converting feature, this MOV to Apple iPad 2 Converter also supports splitting a large mov file into several small ones by built-in clipping tool! In addition to video for Apple iPad 2 conversion feature, Any Video Converter also supports converting videos to various portable devices, such as iPad, iPod, iPhone, PSP, PS3, Apple TV, Xbox 360, Zen player, Blackberry, iRiver video, Zune, and more! iOS 4. The world's most advanced mobile operating system. iOS 4 is the operating system for iPad (along with iPhone and iPod touch). It lets you browse, read, and see everything just by touching the screen. It includes all the powerful, innovative, and fun built-in apps you use every day, many times a day. And it's the platform on which more than 65,000 other amazing apps have been created for iPad. It's highly secure, stable, and responsive, and it's made to work seamlessly with the iPad hardware. iOS 4 is the reason no other device has yet come close to iPad.